Located on the feeder of I-35 it was one of three clubs that Ace played on the 35 feeder. There was Rose Hall, Cheyenne Social Club & I believe the Getaway. It was probably only two clubs but one changed names during the years. There was also a bigger club across the freeway that they played for a year or so that was real nice. I will find out more details to publish later. It must have been the Social Club that was one of the first clubs they played. I remember there was only about 15 people in the club while Ace was playing. Opened in June of 1974, it was as the name says, a warehouse like structure. Located just southeast of downtown , It was a tin building with a raised wood floor being built up off the ground . In the early days I remember Alvin Crow palyed a lot here. There were many other big artist that played at this club. I myself only made one or two shows here. Ace in the Hole originally played here as "Stoneyridge", which consisted of drummer Tommy Foote, lead guitarist Ron Cabal, and bass guitar player Terry Hale, steel player Mike Daily, and singer Joe Dominguez. 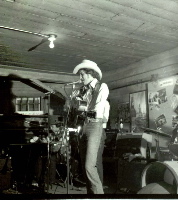 On October 13, 1975, the band, now called the Ace In the Hole Band, debuted at Cheatham Street Warehouse, featuring their newest addition, George Strait. George Strait and Ace in the Hole played their first 50 or 60 gigs on this very stage. It was right before this time that I had one of my longest converstions with George at Gruene Hall. A converstion that at the time I did not realize that may have helped change country music history.